The Washburn WD7S dreadnought acoustic guitar in White. From the Washburn Harvest Series, the guitar features a solid spruce top, mahogany b.. The Washburn WD7S dreadnought acoustic guitar in White. From the Washburn Harvest Series, the guitar features a solid spruce top, mahogany back, sides and neck, and a rosewood fingerboard. 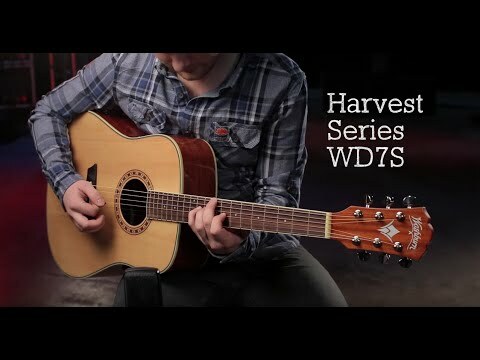 The WD7S is Washburn's most affordable quality-made dreadnought acoustic guitar for stage/performances.